I’m on a roll with pasta this week! When I first got into raw food, I would eat zucchini noodles literally every single night. I think that’s how badly I missed pasta! I would be strangely satisfied in a way that a salad didn’t always deliver. 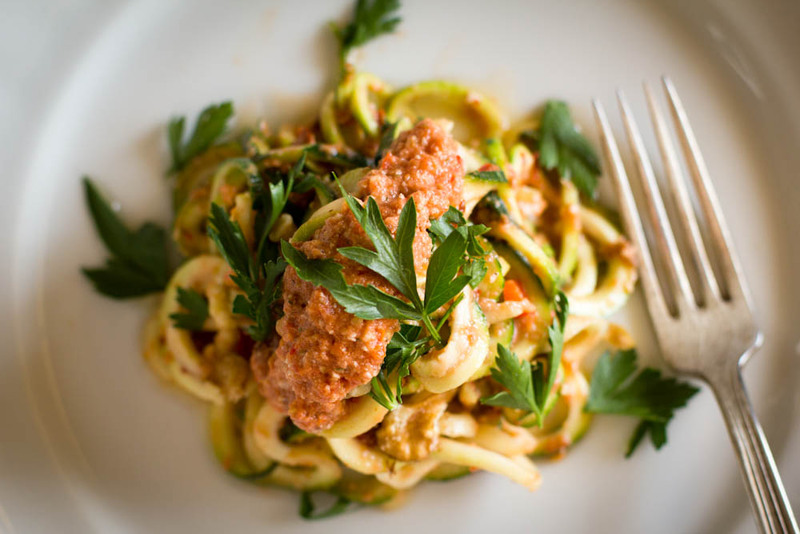 This recipe for raw Zucchini Arrabiata is one from a few years back! If there’s one dish I recommend for people who want to eat better to master it’s a raw pasta. It’s the easiest way to go gluten free, and zucchini is very high water content and nutrient dense. As an outstanding source of manganese and vitamin C, zucchini is a great source of dietary fiber. It also contains vitamin A, magnesium, folate, potassium, copper, and phosphorus. If there’s one piece of kitchen equipment you should get for the raw food diet (besides a knife and a blender! ), it’s a spiral slicer! I got a small travel one at Bed Bath and Beyond that I love because I can throw it in a bag and go. Yes, I’m THAT person that travels with kitchen gadgets in her luggage. 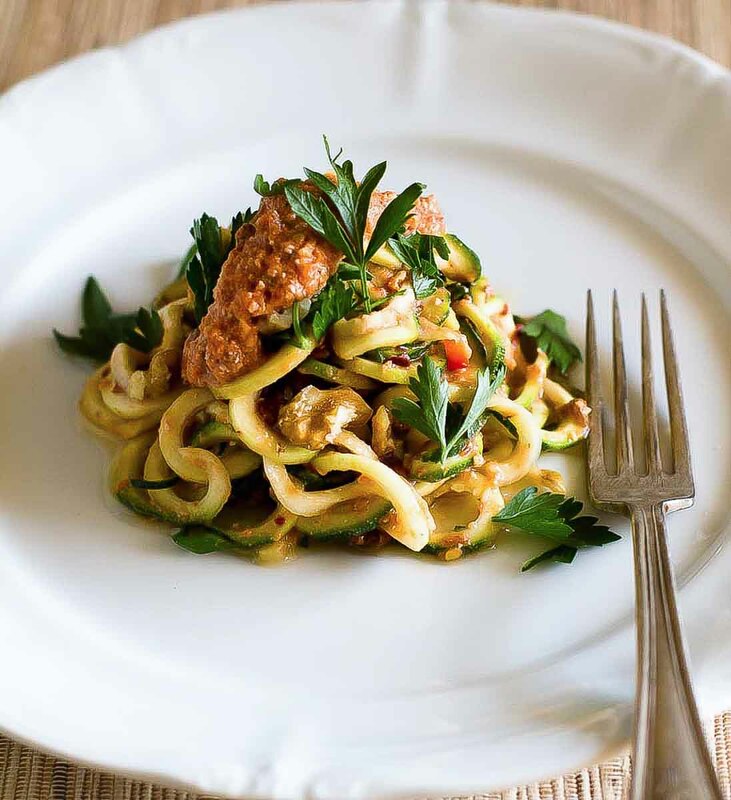 An easy vegan zucchini pasta that brings the heat with a spicy arrabiata tomato sauce.Zucchini ribbons replace the pasta in this flavorful and healthy dish. Process all ingredients together in a food processor until smooth. On a spiral slicer, slice the zucchini into pasta ribbons, or use a vegetable peeler to make long flat noodles down the length of the zucchini. Toss with the other vegetables and herbs, and as much sauce as you would like (probably about ½ cup of sauce per serving). Garnish with more chopped parsley, and chili flakes if you like it spicy. Nutritional yeast is great as “parmesan.